"A classic, hard-hitting refresher with Champagne and gin." Chill cocktail shaker and glass (champagne flute or collins glass) in the freezer. Add ice to shaker. Pour gin, simple syrup, and lemon juice into shaker. Shake well. Fill chilled glass half full of ice, then strain cocktail into the glass. 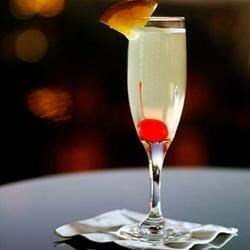 Top with champagne and garnish with a lemon slice. Don't skimp on the ice or skip the chilling. This drink was meant to be served COLD. I'm a fan. Through and through. Tweak it to your personal taste...but my family, friends and myself love it as is. Dreamy. This is "my drink" while going to nice restaurants. Finally decided to try making them at home...gin and tonics took a back seat! This one is a heavy hitter, but I love it! This was light and refreshing. Honestly, I think I'd just drink the bubbles straight, but it was something different. This drink is a good way to use up an open bottle of champagne.